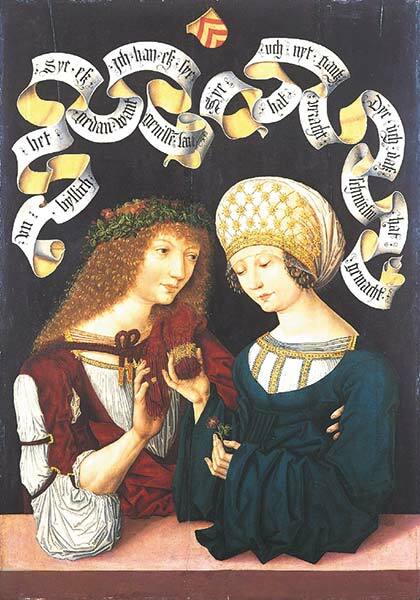 “Pair of Lovers” by Master of the Housebook, circa 1490, is housed at the Herzogliches Museum, Gotha, Germany. These words from the Song of Songs are often chosen by couples to be read at their wedding. They speak of a depth, strength and power of true love, a love that should especially characterize those who enter into the covenant of marriage. They are words to inspire and give hope to couples setting out on the path of a shared life. Valentine’s Day will soon be upon us, and this gives us the opportunity to reflect on the true meaning of romantic love, both for those already married and for those who are courting with a view to a possible marriage. There are many different notions of “love” in our culture today, and it would be good to have a right understanding of romantic love, especially in marriage. First let it be said that for those who are dating, it should always be with a view toward a possible marriage. Deep friendship, even between men and women, is a good and holy thing. But for those who are formally “dating” as romantics, it is more than friendship that is sought. It is about finding out if a person is called to marriage, and if so, if this is “the one.” Dating simply to have a romance with no possible “end game” in sight is not the purpose of the courtship experience. Dating is not an end in itself, but must at least have the possibility of leading to marriage. This gets into the delicate question of physical attraction and physical expressions of romantic love. It even brings up the issue of sexual intimacy between a man and a woman who are not married. There are limits that must be placed on such expressions of romantic love for those who are dating, always with a view toward a possible marriage. Sexual intimacy is not in any way for recreation or for “trying out” the compatibility of the couple. To put it simply, sexual intimacy is for marriage only. With Valentine’s Day around the corner, we must remember that true romantic love is much more than giving candy, flowers and jewelry. If fact, some of the advertising we see around sends the message that such gift giving on Valentine’s Day implies an expected sexual “favor” in return. I don’t want to discourage in any way such expressions of romantic love, but let’s have the proper perspective on why we do such things for our beloved. Real romantic love within marriage, or in preparation for a possible marriage, is not easy and casual, and it is sometimes fraught with struggles and hardships. It demands a love that is much deeper than the superficial expressions that abound in our culture. It demands sacrifice. When men or women bestow affection and even gifts on their beloved on Valentine’s Day, it must be an outward sign of a deeper commitment involving the giving of one’s own self to the other. Romantic love in marriage should sacramentally reflect the love and union between Christ and his Bride, the Church. Jesus laid down his very life for us. He held nothing back. He gave it all for his Beloved. This is what marital love is all about. It is not about achieving perfect happiness here, or about me and my needs. It is a love that always considers first the other. If both parties to marriage could live like this, what a different world we would live in! Let us all pray for true romance! Let us pray for married couples, that they may have a joyful Valentine’s Day as they rejoice in each other. Let us pray especially for those who are struggling amidst the burdens and the harsh realities of life, that they may find healing and reconciliation. And let us pray for those among us who are courting one another, that they may find the true meaning of love that leads to a joy-filled marriage.